Sisters Red | What YA Reading? Scarlett and Rosie March have spent years hunting the Fenris– werewolves who took Scarlett’s eye in a brutal attack years ago. Donning blood-red cloaks and wielding deadly hatchets, the sisters kill Fenris to protect other young girls from a grisly fate. Yet even as the Fenris seem to be gaining power, Rosie dreams of a life beyond wolves. She finds herself drawn to Silas, a young woodsman who is lethal with an ax and is Scarlett’s only friend– but does loving mean betraying her sister and all that they’ve worked for? I came into this read with low expectations. I had just read Red Riding Hood a few weeks ago, and I was drastically disappointed by the awful retelling of such an amazing fairytale as Little Red Riding Hood. But I bought Sisters Red nonetheless. How could a book with such a super awesome cover be bad, right? This book definitely exceeded my expectations. For one thing, I loved the setting. Scarlett and Rosie’s home town, with the rolling hills, the pastures, and the nearest store being 20 minutes away by car, really screamed out ‘”Fairytale!”. The setting changes about 4 chapters into the novel in order for the plot to advance, but the lingering fairytale feeling remains. Next, the Fenris. After Twilight, how many books have I read about hot werewolves? How about… too many? 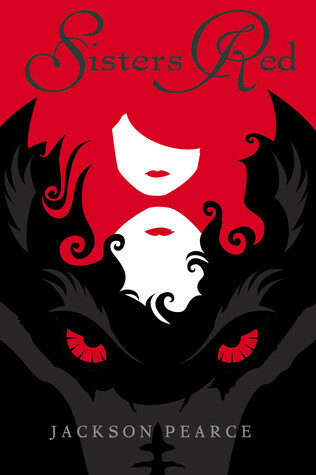 When’s the last time you’ve read a YA book about an evil, soulless monster? Too long ago, my friend. Too long ago. I would personally like to thank Jackson Pearce for reintroducing a YA book with a strong romantic sub-plot that involves a monster that is not a pathetic excuse for that title. The Fenris in Sisters Red were absolutely refreshing. Scarlett and Rosie’s relationship is complicated. Having lost her right eye at age ten to protect Rosie from a Fenris that killed the girls’ grandmother, Scarlett is bitter and scarred. She is jealous of her sister’s beauty, but desperate to keep her that way. Rosie alternates between being angry at her sister for not letting her hunt the Fenris enough, to not wanting to hunt the Fenris at all, but doing so anyway because she owes Scarlett her life. Scarlett refuses to let Rosie hunt alone, but feels disgusted at her for thinking of quitting. Scarlett’s attitude toward anyone who doesn’t drop everyone and everything to hunt werewolves is, to put mildly, disgust. She calls girls who beautify themselves ‘Dragonflies’, and marvels at their stupidity for making themselves more appealing to werewolves. This is quite hypocritical really, because the Dragonflies are completely ignorant of the girl-eating Fenris that would love to tear them to pieces and eat their hearts. However, in between the lines of Scarlett’s hateful feelings is jealousy. This makes Scarlett a very believable and deep character… if you knew that you could save the world from monsters, but that it would make you ugly, you would save the world anyway, right? But wouldn’t that also make you resentful of the beautiful people whom you were saving? Pearce works through Scarlett’s tangled thoughts quite well. I had three issues with Sisters Red: a certain romantic relationship, Rosie’s ‘forgetfulness’, and the predictability of the book’s outcome. And then there’s the fact that Rosie always forgets her hunting knives. She’s seen werewolves in what, 6o public places? Yet she constantly forgets the tools for her greatest asset against the them: her aim. And she’s supposed to be a smart character? Uh-huh. The solution to the plot’s main mystery was also very predictable. I saw it coming about 7 chapters before it unfolded. This causes the pace to lag somewhat. Finally, Sisters Red deserves 3.5/5 stars. For fans of creepy monsters and action/romance novels.